On Saturday, February 24, 2018 it is time to celebrate decades of the VLSCS GALA, Victoria’s preeminent lesbian event! The evening will be a festive, fun-filled time with gorgeous food, great mix and mingling, and dancing to one of the hottest lesbian-fronted bands in the city, The Soul Shakers! 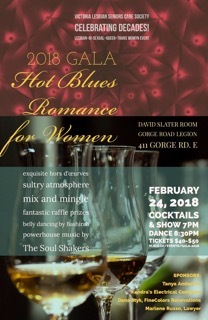 It will be a romantic nod to the great women of the Blues, with music that will have you dancing and grooving all night long! Put on your fancies and come meet up with old friends, strike up new ones or maybe a romance, or take your love for a special night out. The GALA has something for everyone! The evening will start with a cocktail party mix-and-mingler featuring exquisite hors d’œurves, fine DJ’d music, and a performance by Bashirah Middle Eastern Dance. There will be quiet areas for sitting and chatting with friends, and festive ones for meeting, mingling and grooving! We have a fantastic raffle planned, with some amazing prizes that you won’t believe!! For all the wonderful “single for now” folks who may want to meet others, there will be special wrist bands and other opportunities to help you connect. You never know what magic might come of the evening! Tickets are sliding scale $40-$50 and a vital part of keeping the gala strong for future years so please give generously! To purchase easy Online Tickets, CLICK HERE. Keep current on all the details as we approach the event by joining the GALA 2018 Facebook Event Page here. You can invite others through this page too! The GALA venue is wheelchair accessible, with full size elevator and accessible washrooms. It is on bus route #8 and #11 that stop just in front of building and there is also a large parking lot with free parking. To view and/or print poster, click here. If you are a business and interested in sponsoring event, please click here for our sponsorship package. 7:00-8:30pm Cocktail party, exquisite hors d’œurves, mix and mingling, dance performance by Bashirah Middle Eastern Dance. 10:45 – Midnight – DJ music and “lounge space” for quieter discussions.